This is one of my favorite Hohlweins. I love it because of the design of the piece and the exquisite illustration, the restraint he used in dropping in the bright blue highlights in the hair. I don't think design and illustration can compliment each other much better than this does. Published in the period 1906 to 1914, it is a remarkable piece for that time. 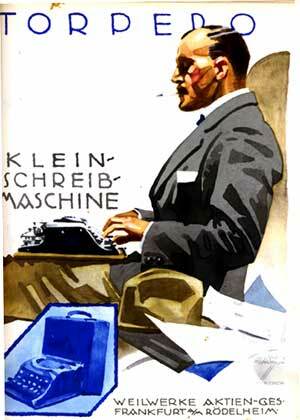 Even when Hohlwein was given a mundane assignment, Man at Portable Typewriter, for example, his mastery of watercolor transcends the banality of the layout that is made further chaotic with the insert of product, no doubt at the insistence of a sales manager. Hohlwein's handling of it proves his disdain. This is so good that it's almost reckless. 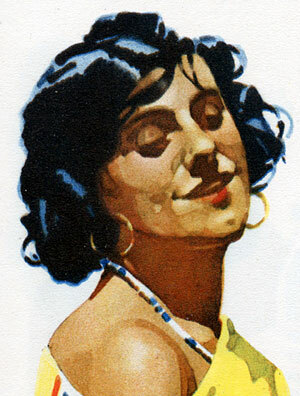 This is from a much later period, from 1920 to 1926 and it's done with a much more loose technique than the Riquetta poster, above, or Gipsy, below. 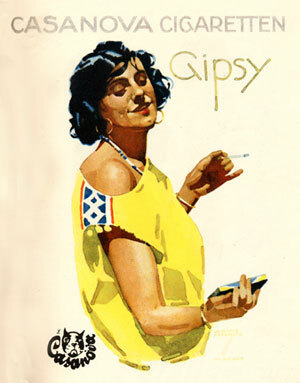 A beer poster from the early 1920s. The design and illustration are harmonious and powerful without being overbearing. The simplicity of a highly developed style leaves much to the imagination of the viewer and consequently increases the interest and appreciation of a splendid poster. 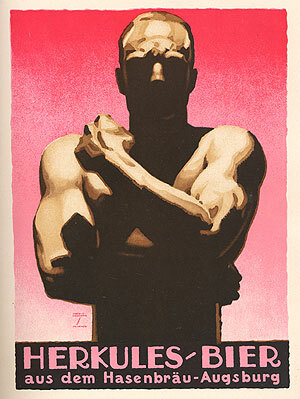 One of his most popular posters, it is also a masterful combination of design and illustration. The distinct hand-lettering that also identifies so much of Hohlwein's work is perfect for its time and place, so avant garde without detracting from the illustration. I'll end this homage to the master with this very fine portrait. Ludwig Hohlwein's characters are rendered so human and without artifice that we have no doubt we have seen them somewhere in the flesh. Fernando -- I understand you. I have offered a subjective opinion so it's open to argument and disagreement. As both a designer and illustrator, my observation is that Hohlwein was more illustrator than designer, and Bernhard more designer than illustrator. Hohlwein did not experiment much at all with type styles and resorted mostly to a specific style of hand-lettering, whereas Berhard was a typophile, experimenting with different faces and most importantly, a type designer as well. Bernhard had a much wider focus in the graphic arts. 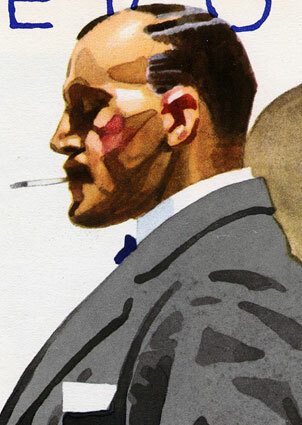 However as illustrator, Hohlwein had the greater skill, in my opinion. I have a question. Why did u say Bernhard and Ludwing style are so differents? I think it is different, ok... but in both artists we find a idea about simplicity. Maybe , school from Berlin is most german or gothic... or with more influence... i dont know if you understand me.